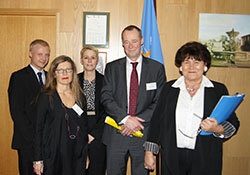 On 9 January 2012, a delegation from the Ministry of Health of Denmark visited WHO/Europe. Ms Zsuzsanna Jakab, WHO Regional Director for Europe, briefed the group on the main WHO initiatives in the European Region. The meeting also provided an opportunity to discuss current and future collaboration and areas in which WHO could support Denmark in its Presidency of the Council of the European Union. The Danish delegation comprised staff of the Ministry (Per Okkels, Permanent Secretary; Katrine Schjønning, Head of Division, International Cooperation; and Erich Erichsen, Head of Section, International Cooperation) and the National Board of Health, Denmark (Else Smith, Chief Executive Officer). addressing the challenge of noncommunicable diseases, using diabetes as a model. In the EU, 2012 is the European Year for Active Ageing and Solidarity between Generations, focusing on how older people can remain healthy and active longer.